Luckily for these wild animals, and some 200 others, they have now found their way to the Veles Center, an out-of-the-way operation regarded as Russia’s premier facility for rehabilitating wild animals that were abandoned or fell victim to human callousness. “During the flight, she escaped from the cage and was wandering in the luggage compartment. When the plane landed at Pulkovo airport and personnel started to unload luggage, they found a lion that was attacking people,” said center veterinarian Natalya Bondarenko. “There were two chains around her neck that grew into the body; one grew seven centimeters (nearly three inches) inside her neck,” Fyodorov said. The center aims to release its animals back into the wild, but for many that’s not possible because of environment or because they become dependent on human care and lose their survival skills. 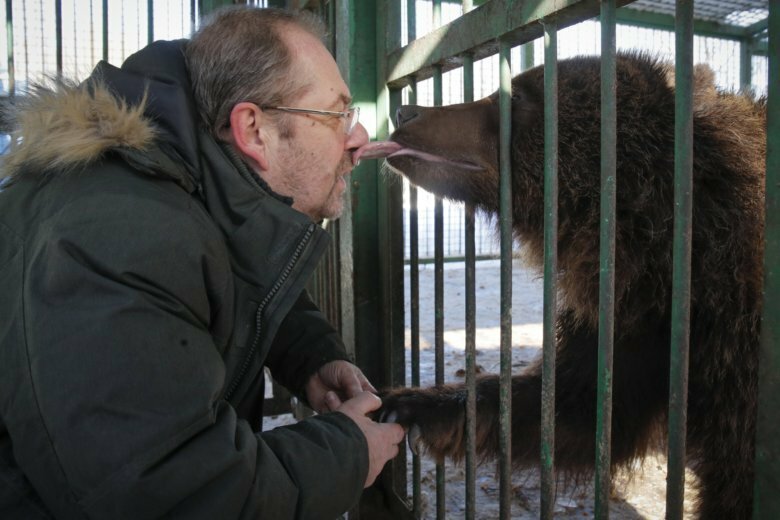 “The wolf considers himself a father for the bears, takes care of them, protects them if he feels there is any danger,” the vet Bondarenko said. Veles, named after a Slavic pagan god of cattle, is an unusual undertaking in Russia, where care for wild animals largely is a “disaster,” says Svetlana Ilyinskaya of the Center for Legal Protection of Animals. “We are missing centers both for saving animals and for supporting them. There is no state support or policy regarding the matter,” she says.